Big Data NoSQL databases were pioneered by top internet companies like Amazon, Google, LinkedIn and Facebook to overcome the drawbacks of RDBMS. RDBMS is not always the best solution for all situations as it cannot meet the increasing growth of unstructured data. As data processing requirements grow exponentially, NoSQL is a dynamic and cloud friendly approach to dynamically process unstructured data with ease.IT professionals often debate the merits of SQL vs. NoSQL but with increasing business data management needs, NoSQL is becoming the new darling of the big data movement. What follows is an elaborate discussion on SQL vs. NoSQL-Why NoSQL has empowered many big data applications today. 1000 users of a web application, was a major load on the app, in the early days and 10,000 users were considered an extreme scenario. As per the web statistics report in 2014, there are about 3 billion people who are connected to the world wide web and the amount of time that the internet users spend on the web is somewhere close to 35 billion hours per month, which is increasing gradually. With the availability of several mobile and web applications, it is pretty common to have billions of users- who will generate a lot of unstructured data. There is a need for a database technology that can render 24/7 support to store, process and analyze this data. Can the conventional SQL scale up to these requirements? “It’s important that you’re not just going with a traditional database because that’s what everyone else is using.Pay attention to what’s going on in the NoSQL world because there are some problems that SQL cannot handle.”-said Evaldo de Oliveira, Business Development Director at FairCom. The fundamental concept behind databases, namely MySQL, Oracle Express Edition, and MS-SQL that uses SQL, is that they are all Relational Database Management Systems that make use of relations (generally referred to as tables) for storing data. In a relational database, the data is correlated with the help of some common characteristics that are present in the Dataset and the outcome of this is referred to as the Schema of the RDBMS. Relational Database Management Systems that use SQL are Schema –Oriented i.e. the structure of the data should be known in advance ensuring that the data adheres to the schema. Examples of such predefined schema based applications that use SQL include Payroll Management System, Order Processing, and Flight Reservations. It is not possible for SQL to process unpredictable and unstructured information. However, Big Data applications, demand for an occurrence-oriented database which is highly flexible and operates on a schema less data model. IT enterprises need to increase the RAM, SSD, CPU, etc., on a single server in order to manage the increasing load on the RDBMS. With increasing size of the database or increasing number of users, Relational Database Management Systems using SQL suffer from serious performance bottlenecks -making real time unstructured data processing a hard row to hoe. With Relational Database Management Systems, built-in clustering is difficult due to the ACID properties of transactions. NoSQL is a database technology driven by Cloud Computing, the Web, Big Data and the Big Users. NoSQL now leads the way for the popular internet companies such as LinkedIn, Google, Amazon, and Facebook - to overcome the drawbacks of the 40 year old RDBMS. NoSQL Database, also known as “Not Only SQL” is an alternative to SQL database which does not require any kind of fixed table schemas unlike the SQL. NoSQL generally scales horizontally and avoids major join operations on the data. NoSQL database can be referred to as structured storage which consists of relational database as the subset. NoSQL Database covers a swarm of multitude databases, each having a different kind of data storage model. 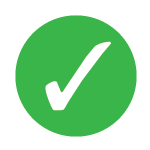 The most popular types are Graph, Key-Value pairs, Columnar and Document. Enrol for Big Data NoSQL Database course to master your NoSQL skills! The foremost criterion for choosing a database is the nature of data that your enterprise is planning to control and leverage. If the enterprise plans to pull data similar to an accounting excel spreadsheet, i.e. the basic tabular structured data, then the relational model of the database would suffice to fulfill your business requirements but the current trends demand for storing and processing unstructured and unpredictable information. To the contrary, molecular modeling, geo-spatial or engineering parts data is so complex to be dealt with – that the Data Model created for this kind of data is highly complicated due to several levels of nesting. Though several attempts were made to model this kind of data with the ‘2D (Row-Column) Database’ - it did not fit . In this world of dynamic schema where changes pour in every hour it is not possible to adhere to the “Get it Right First” Strategy - which was a success with the outmoded static schema. Web-centric businesses like Amazon, eBay, etc., were in need of a database like NoSQL vs SQL that can best match up with the changing data model rendering them greater levels of flexibility in operations. RDBMS requires a higher degree of Normalization i.e. data needs to be broken down into several small logical tables to avoid data redundancy and duplication. Normalization helps manage data in an efficient way, but the complexity of spanning several related tables involved with normalization hampers the performance of data processing in relational databases using SQL. On the other hand, in NoSQL Databases such as Couchbase, Cassandra, and MongoDB, data is stored in the form of flat collections where this data is duplicated repeatedly and a single piece of data is hardly ever partitioned off but rather it is stored in the form of an entity. Hence, reading or writing operations to a single entity have become easier and faster. NoSQL databases can also store and process data in real time - something that SQL is not capable of doing it. The most beneficial aspect of NoSQL databases like HBase for Hadoop, MongoDB, Couchbase and 10Gen’s is - the ease of scalability to handle huge volumes of data. For instance, if you operate an eCommerce website similar to Amazon and you happen to be an overnight success - you will have tons of customers visiting your website. Under such circumstances, if you are using a relational database, i.e., SQL, you will have to meticulously replicate and repartition the database so as to fulfill the increasing demand of the customers. The manner in which NoSQL vs SQL databases scale up to meet the business requirements affects the performance bottleneck of the application. 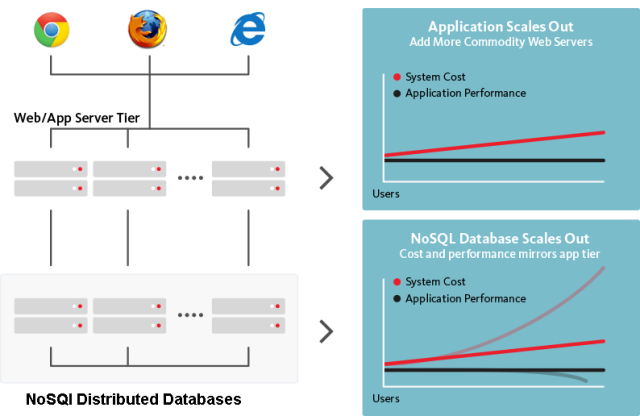 Generally, with increase in demand, relational databases tend to scale up vertically which means that they add extra horsepower to the system - to enable faster operations on the same dataset.On the contrary, NoSQL Databases like the HBase, Couchbase and MongoD, scale horizontally with the addition ofextra nodes (commodity database servers) to the resource pool, so that the load can be distributed easily. Relational databases using SQL have been legends in the database landscape for maintaining integrity through the ACID properties (Atomicity, Consistency, Isolated, and Durable) of transactions and most of the storage vendors rely on properties. However, the main motive is to shore up isolated non-dividable transactions - where changes are permanent, leaving the data in a consistent state. 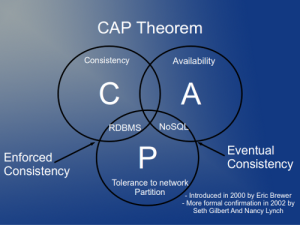 NoSQL Databases work on the concept of the CAP priorities and at a time you can decide to choose any of the 2 priorities out of the CAP Theorem (Consistency-Availability-Partition Tolerance) as it is highly difficult to attain all the three in a changing distributed node system. S= Soft State – The state of the system can change anytime devoid of executing any query because node updates take place every now and then to fulfill the ever changing requirements. E=Eventually Consistent- NoSQL Database systems will become consistent in the long run. Why should you choose a NoSQL Database like HBase, Couchbase or Cassandra over RDBMS? 3)To process Big Data, these databases need continuous application availability with modern transaction support. HBase for Hadoop, a popular NoSQL database is used extensively by Facebook for its messaging infrastructure. HBase is used by Twitter for generating data, storing, logging, and monitoring data around people search. 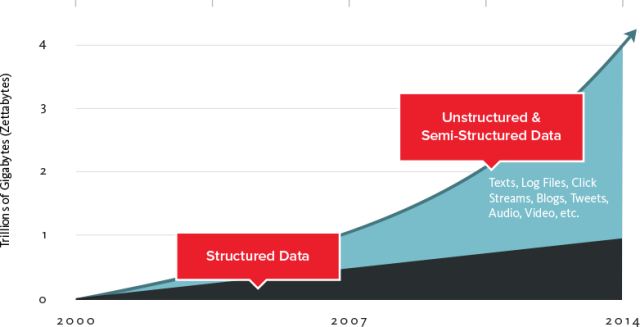 HBase is used by the discovery engine Stumble upon for data analytics and storage. MongoDB is another NoSQL Database used by CERN, a European Nuclear Research Organization for collecting data from the huge particle collider “Hadron Collider”. LinkedIn, Orbitz, and Concur use the Couchbase NoSQL Database for various data processing and monitoring tasks. The Database Landscape is flooded with increased data velocity, growing data variety, and exploding data volumes and only NoSQL databases like HBase, Cassandra, Couchbase can keep up with these requirements of Big Data applications. Storage, Manage and Retrieve Unstructured Data by mastering your Big Data NoSQL Database Skills!